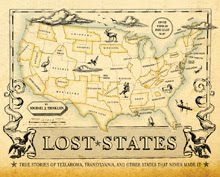 Lost States author Michael Trinklein is available for media interviews. If you're doing a story about the latest 51st state proposal... or you just want some background on the history of making new states, Mike can help. He's written on this topic for the Wall Street Journal and Boston Globe... talked on C-SPAN and NPR... and been interviewed by dozens of other media outlets, including the Huffington Post. And, oh yeah, he wrote the book on the topic, Lost States. Mike's email is mike@loststates.com or you can call at 262.323.1999.